Ever since the first slot machine was produced well over a century ago, the slot machine has been a great success and the popularity of the “one armed bandit” is certainly not showing any signs of decline. On the contrary, online gambling over the internet has brought an enormous selection of slot machines into our homes and slot aficionados are no longer forced to settle for the slot machines available in their local casino or gambling hall. The father of slots was a mechanic named Charles Fey who, in the late 1800s, put together a slot machine in San Francisco, USA. He gave his slot machine three reels and adorned them with five different symbols: hearts, spades, clubs, horse shoes and the Liberty Bell. 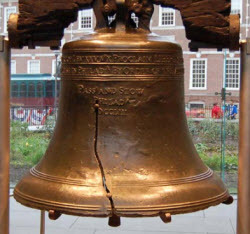 Fey named his machine Liberty Bell in honor of the famous bell in Philadelphia and started promoting his machine to local business owners. Fey made a lot of Liberty Bell machines but did not put them up for sale. Instead, anyone who wished to place a Liberty Bell slot machine in their establishment would have to agree to give 50% of the profits to Fey. In 1891, Pitt and Sittman constructed a five reel slot machine with a poker theme for New York bars and night clubs. Since it had five reels, it was possible to get a complete poker hand on the payline. The better the hand, the better the reward. The poker slot machine could not pay out coins; winners would instead go to the bar and be given drinks, cigarettes and other similar gifts. All the early slot machines were fully mechanical and pulling the lever was a necessity. Eventually, the concept of using electricity to power the slot machines began to take root and in 1963 Bally Technologies launched the very first wholly electrical slot machine Money Honey. Today, the lever is not necessary to start a slot machine and most machines have start buttons instead of a lever. When a lever is present it is normally for nostalgic reasons – some slot players simply like to pull the lever. A video slot is a slot machine without any spinning reels. Instead of reels, the machine has a monitor where animated reels are shown. The outcome of each spin is determined by a Random Number Generator (RNG) and the animated reels are just there for show. Even though the monitor could show just about anything, most modern video slot game still have the spinning reels since this is what slot players have grown accustomed to. There are however examples of slot games that do display other things. Gonzo’s Quest – a slot game developed by NetEntertainment for online casinos – will for instance show engraved stones that come tumbling down all over the screen instead of the traditional spinning reels. Having a monitor instead of actual physical reels have also allowed game developers to produce bonus games that can be very different from the main game. A traditional spinning-reels type of slot game can for instance feature a bonus game that presents you with a roulette wheel, or a shot at the dice table, or a pick-and-click interactive bonus round. The possibilities are endless and some modern video slots even have more than one bonus round that can be accessed from the main game.